Submit your T-shirt design for Giving Tuesday! 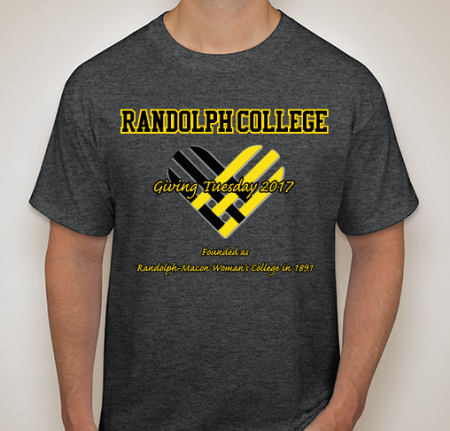 For the fourth year, Randolph will join the worldwide Giving Tuesday movement, which takes place on November 27. New to the event this year this year is a T-shirt design contest for students. Submissions are due by October 25, and the winner of the contest will receive a $20 gift card to Magnolia Foods. In addition, the first 50 students to submit a design will receive a free shirt with the winning design. All entries must use the Giving Tuesday logo, which can be found here. To submit your design, add it to the Google Drive folder or email Tamara Jamerson, director of the Annual Fund, at tjamerson@randolphcollege.edu. Last year nearly 600 alums, parents, students, faculty and staff, and friends of Randolph College united to raise over $150,000 for the Annual Fund on Giving Tuesday, which was the largest online giving day in the College’s history. The Annual Fund provides crucial unrestricted revenue that touches many facets of the Randolph experience, including scholarships and internships, faculty professional development, and campus beautification, just to name a few areas. For more information about Giving Tuesday and how you can participate, please visit http://www.randolphcollege.edu/give/givingtuesday/.